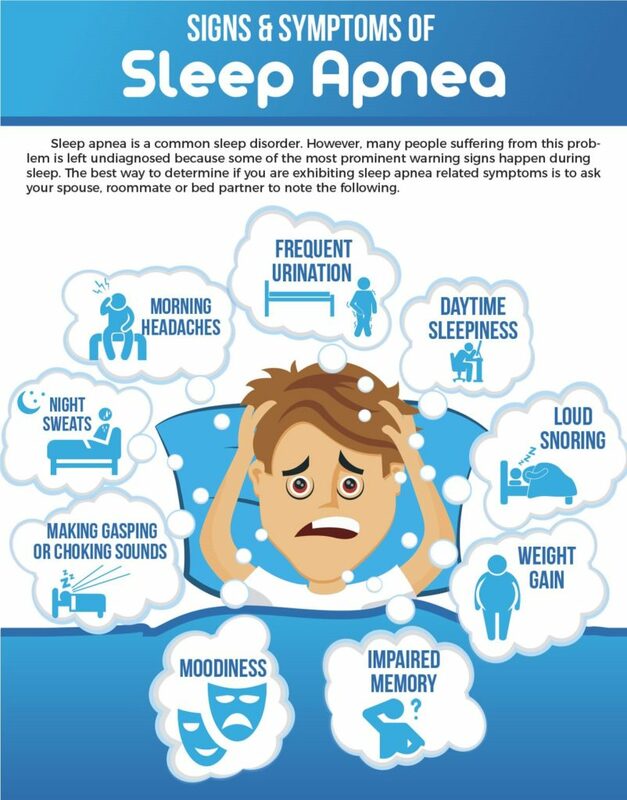 Signs of Sleep Apnea: The Bedtime Battle! With long hours spent at work, and the sometimes-grueling daily grind in today’s workforce, it’s easy to see why bedtime is such a welcomed time of day for many people. However, signs of sleep apnea can cause constant interruptions in one’s rest that can quickly turn this time of relaxation into an exhausting, nightly battle for sleep! Certainly, such a scenario sounds like a nightmare; however, for those suffering from sleep apnea, this nightmare is an unfortunate reality as those afflicted must endure this bedtime battle on a regular basis! Due to this, the signs of sleep apnea are frequently characterized incorrectly as simply a nuisance; a nuisance generally experienced by the sleeping partner of the sufferer rather than the sufferer themselves. It may even be indicative of other serious underlying health issues such as diabetes, neurological illness, mental illness, or heart disease. While sleep apnea can certainly be a problematic disorder if left unchecked or improperly treated, fortunately thanks to combined effort from both professional dentistry as well the general and specialized fields of orthodontic and respiratory therapy research, signs of sleep apnea can be identified and treated in several ways. Although the overall success in treating sleep apnea remains relatively high, the rate of success depends heavily on finding the exact cause of the disorder, and therefore select the appropriate method of treatment. Types & Triggers: What Causing Your Sleep Apnea? While usually following a similar pattern, identifying and classifying your specific type of sleep apnea is indeed a crucial part of resolving the disorder, as sleep apnea can have multiple causes, and can manifest itself in several different variations. Unquestionably, the most common variation of the disorder is known as Obstructive Sleep Apnea and as its name implies, indicates an obstruction or blockage within the sufferer’s airway. This occurs as result of muscle relaxation causing the tongue to inadvertently cover and block off the airway, thereby hindering the flow of air. Central Sleep Apnea is another distinct (but much less common) variation of sleep apnea, which is triggered from a highly different source altogether. Contrasting heavily to the before-mentioned obstructive sleep apnea, Central Sleep Apnea originates within the brain stem of the afflicted individual, and directly affects the central nervous system’s ability to transmit signals throughout the body. With the central nervous system compromised, both voluntary and involuntary muscle movement becomes increasingly restricted, therefore causing interruptions in involuntary actions such as breathing. This can be particularly problematic during sleep, as the suffer may repeatedly experience abrupt awakenings while attempting to rest, as a natural reaction to the sudden lack of oxygen. Certainly, both aforementioned types of sleep apnea can present a whole slew of problems in terms of one’s physical and mental well-being. Unfortunately for a certain number of sleep apnea suffers, the disorder can even evolve into a compound issue, in which they develop what’s known as Complex Sleep Apnea Syndrome. Complex Sleep Apnea Syndrome, (or perhaps more appropriately referred to as Mixed Sleep Apnea) is the simultaneous manifestation of both Obstructive and Central Sleep Apnea. Obviously, this is considered to be the most severe variation of sleep apnea, and while cases of Complex Sleep Apnea are exceptionally rare, it can occur if sleep apnea is improperly treated, or by interference of additional health issues or outside circumstances. To combat and alleviate the various issues caused by sleep apnea, the Continuous Positive Airway Pressure machine, (better known as the “CPAP Mask”) was developed during the early 1980s. Being the only device of its kind at the time, the CPAP mask has been widely successful since its inception and continues to be the most commonly used therapy when treating the disorder. Despite its undeniable success, the CPAP mask is not without its flaws as the cumbersome and somewhat awkward facial apparatus has been known to cause varying degrees of discomfort, thus leading to a less then desirable or even intolerable experience among some users. Therefore, to accommodate those with this issue, and provide sleep apnea sufferers with an alternative treatment method, the dental industry has introduced a new type of mouth guard to be used to manage the affliction. While historically a mouthguard is best known for being an essential piece of equipment for athletes in various sports; however, more recently they have become known serving another important purpose. This purpose, (of course) is providing an alternative method in the ever-consistent battle against sleep apnea. Used primarily in treating the much more common Obstructive Sleep Apnea, the Mandibular Advancement Device (or MAD mouthguard as its often called) is a night-time mouth guard that at first glance, resembles a standard sports mouth guard in general appearance. However, unlike the sports mouth-guard, the unique MAD mouth guard is designed to shift forward and re-position your jaw, thus preventing the tongue (or anything else) from obstructing and blocking airflow. This not only reduces the signs of sleep apnea, including excessive snoring and wheezing during sleep, but also allows the sufferer to experience a much deeper and uninterrupted nightly rest, thus significantly improving the health and overall well being of the individual! Surviving Sleep Apnea: You CAN Do It! We CAN Help! At GPS Dental, we have helped many patients suffering from sleep apnea for a several years now and look to continue doing so as the annual number of sleep apnea suffers within the U.S. continues to remain largely stagnant. As human beings, we are an active, intelligent, and highly successful species; however, when robbed of the necessary amount of sleep, our bodies’ natural ability to function is severely hindered. Simply put, you NEED your sleep, and with an ongoing issue like sleep apnea, getting a good nights sleep can be almost impossible! If this sounds like you, come see us here at GPS Dental as by visiting our offices, Dr. Skrobanek can assess your sleep apnea and determine if the MAD appliance is right for you! Dr. Gary P. Skrobanek is an expert in sleep apnea and would like to discuss your signs of sleep apnea at your consultation or dental appointment. His experienced, friendly team at GPS Dental offers affordable dentistry and gentle family dental care in the San Antonio, TX area. Our Brooks City Base dentist office is conveniently located and offers early morning appointment times Monday through Friday to meet your needs. At GPS Dental, we provide most dental services, from family and general dentistry to dental implants, sleep apnea, TMJ / TMD Treatment, cosmetic dentistry and much more. We accept most dental insurance plans and offer affordable financial solutions for any budget. Call us at (210) 633-3477 to make an appointment.